The Queens 10K was the third of the borough races this year, and the second one I ran. 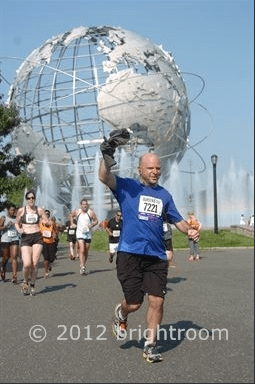 Having run the Brooklyn Half Marathon in May, and needing to do more races for the 2013 marathon, I decided I would run the borough races to gain entry to the 2013 NYC Half, even if I choose not to run it. Although it was as high as 90 degrees by the end of the Queens 10K, the race was more prepared for the hot weather than the Giants Stadium 5K. Every mile had water stations, and each one had “misting stations,” which was just a hose connected to a hydrant that sprayed an arc over the road, which lead to puddle dodging while trying to cool off. The race course took us around Flushing Meadows Park. 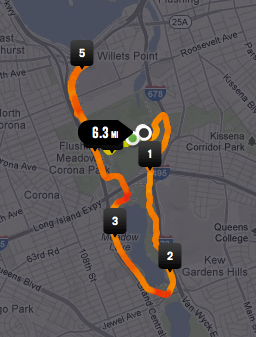 We started by running past the Fountain of the Planets and ran parallel to the Van Wyck Expressway before turning back and running paralleo to the Grand Central Expressway. We looped around and headed back towards the Unisphere, a giant metal globe over a fountain, before returning to the fountain and completing the 6.2 mile journey. The most epic moment for me was as I started approaching the Unisphere, the book I was listening to (a version of DC’s Infinite Crisis) began to cue the Superman theme. As I got closer to the globe, the music swelled and it was an invigorating moment in the race for me. Even with the heat, I was able to complete the Queens 10K in 1:00:37. Although I would have liked to complete it in under an hour, the heat caused me to run an average 9:48, which just gives me a goal for the next 10K I run.